at EU-US Privacy Shield launches: Key points to this agreement. Whether that agreement will hold water over the long term is questionable. Also important, as WeLiveSecurity writes is that as "an ICO survey from 2015 revealed, 85% of respondents are worried about “how their personal information is passed or sold to other organizations”. It is a big deal." Consider that fact when looking at the recently announced Facebook intent to harvest WhatsApp data. That kind of privacy and security abuse should be stopped cold in its tracks. It is indeed "a big deal". By the way, WeLiveSecurity offers the option to subscribe to their postings. summarizing an excerpted section that deals with the work of Paul Meehl. "In today's encore selection -- from Thinking, Fast and Slow by Daniel Kahneman. Statistics versus judgment. In his book Clinical vs. Statistical Prediction: A Theoretical Analysis and a Review of the Evidence, psychoanalyst Paul Meehl gave evidence that statistical models almost always yield better predictions and diagnoses than the judgment of trained professionals. In fact, experts frequently give different answers when presented with the same information within a matter of a few minutes...."
We are in the process of moving our LexiLine, History of Civilization Yahoo! Group (at Yahoo! Groups since the year 1999) to our new forum at ProBoards.com, a free online board portal to our liking. The Lexiline ProBoards forum has been started at ProBoards at the URL http://lexiline.proboards.com titled as Lexiline : Civilization : Arts : Sciences : Archaeology : Technology : Astronomy : Anthropology. The "public", i.e. guests, are free to view the board but only members of the Lexiline forum can post. Requests to become a member of the group must be approved by the Lexiline forum administration. Membership must be restricted to retain control over spam and flamers, who can be removed and/or banned, so please, apply for membership only if you have a serious interest in the topics discussed on the forum, i.e. the history of civilization, arts & sciences, archaeology & anthropology, technology e.g. 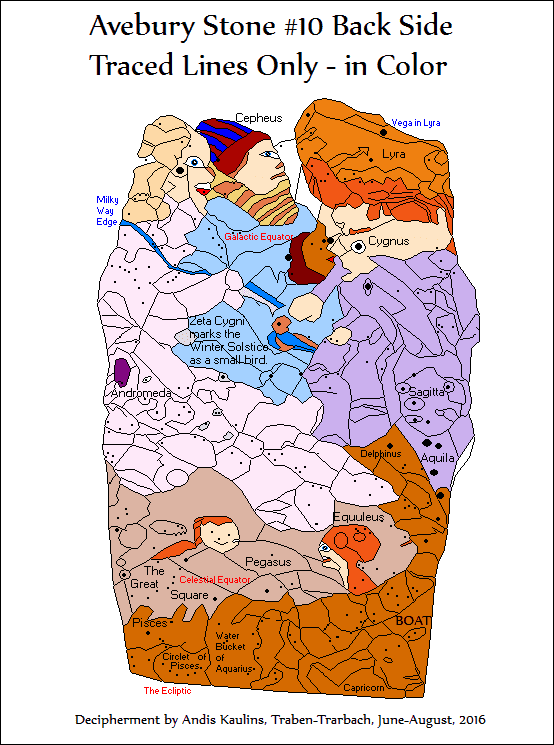 astronomy, including archaeoastronomy, and related disciplines -- all from a prehistorical viz. historical perspective. Future members should read the help files at ProBoards to get acquainted with the system. Looks like a lot of fun! ProBoards gives forum members a greater opportunity for interactive participation. We intend to take a step back at this new forum from full responsibility and will be looking for additional moderators among the members. Let us know if you are interested. We see the forum as a long-term project. It all depends on how many people join and how high the interest level proves to be. Right now we are using the free version of ProBoards. If it proves to be successful, we could move to the monthly payment scheme, which would eliminate the ads. But this remains to be seen. Enjoy! 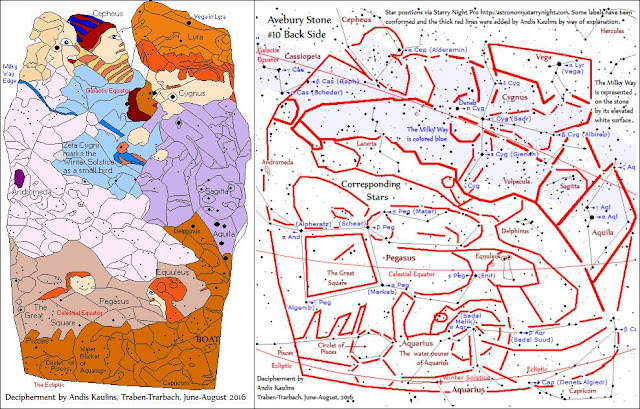 This is a graphic image comparing the tracing in color of the back side of Avebury Stone #10 with an illustrated sky map of the corresponding stars and the stellar region corresponding to the tracing result for the back side of Avebury Stone #10. The positions of the stars are an underlying sky map clipped using the astronomy software program Starry Night Pro, http://astronomy.starrynight.com. 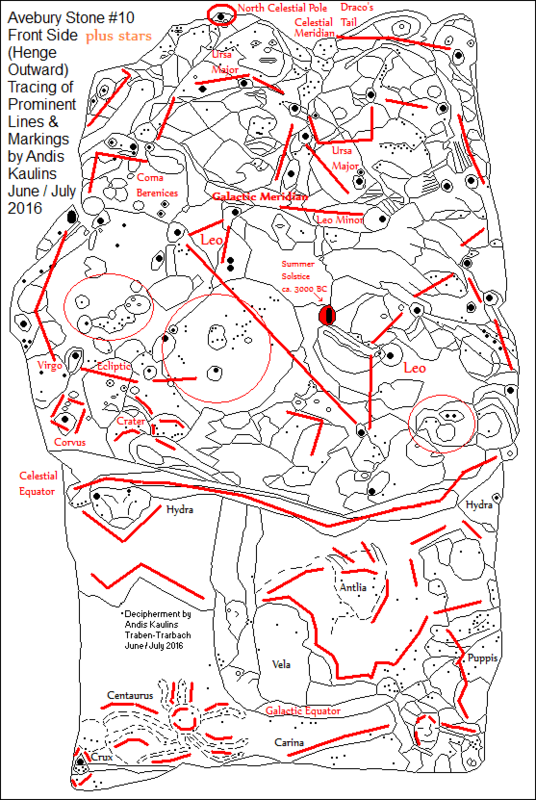 Andis Kaulins, who is not affiliated with Starry Night Pro, has added texts, changed labels and inserted the explanatory thick red lines, showing the image correspondence. This is a sky map of the stars and the stellar region corresponding to the tracing result for the back side of Avebury Stone #10. 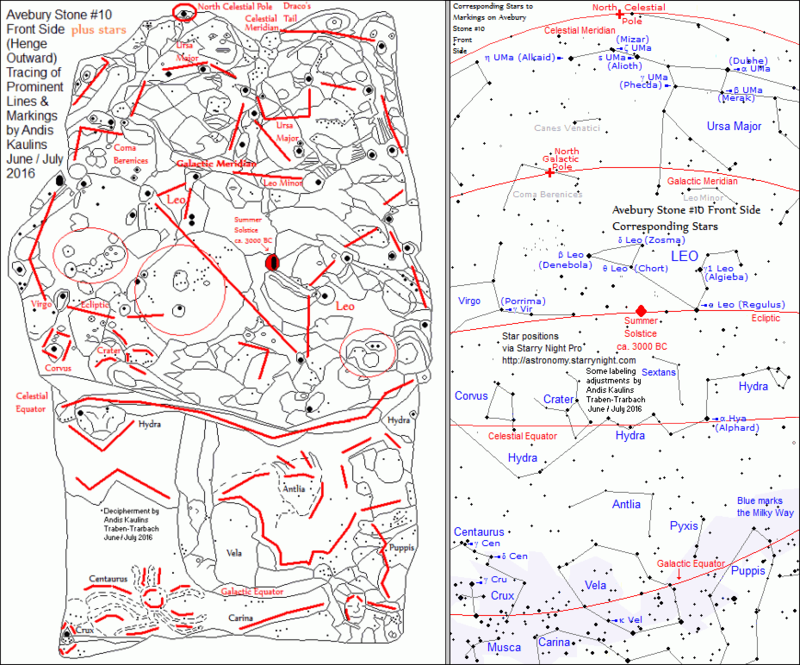 The positions of the stars are an underlying sky map clipped from the astronomy software program Starry Night Pro, http://astronomy.starrynight.com. Andis Kaulins, who is not affiliated with Starry Night Pro, has added the texts, changed labels and thick red lines by way of explanation. 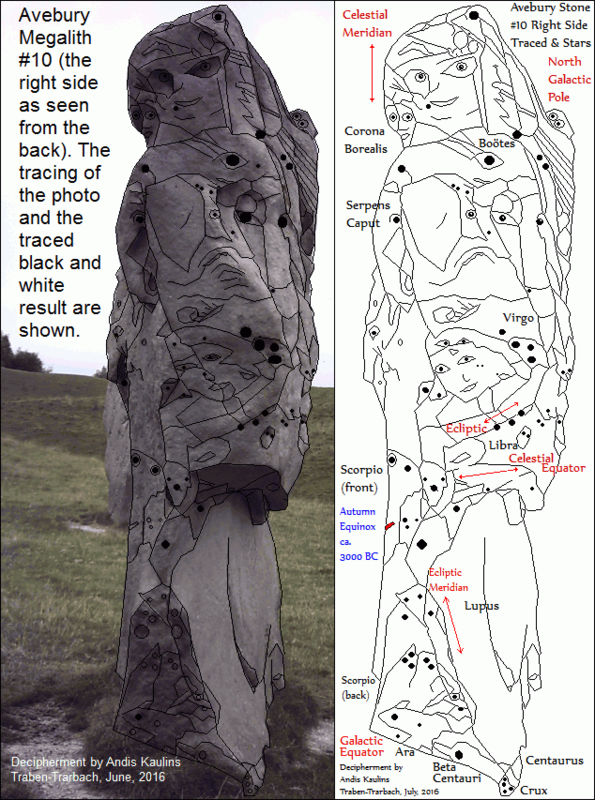 This posting is followed by a posting that compares the corresponding stars with the tracing in color of Avebury Stone #10 Back Side in one image. 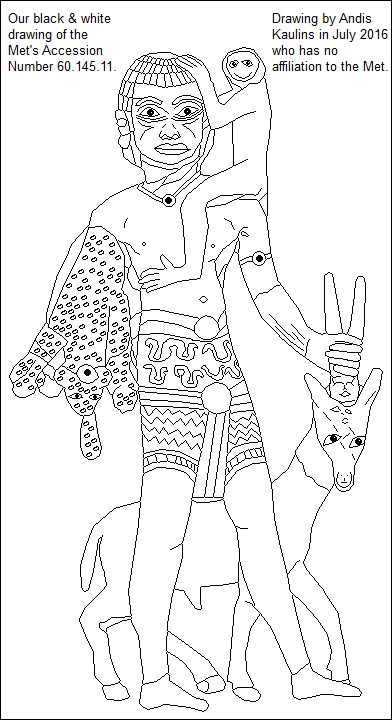 This is the tracing result for the back side of Avebury Stone #10 in color with the stars identified. 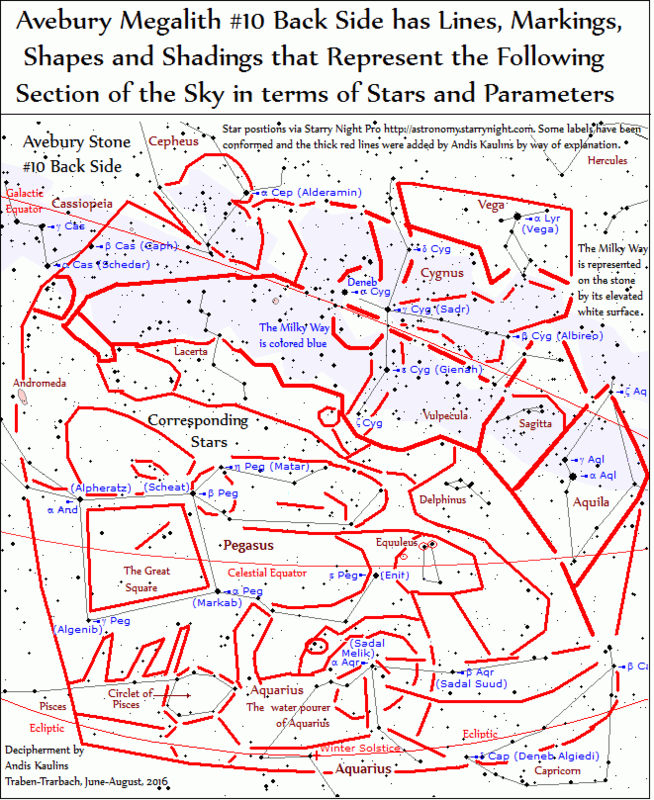 A sky map with the corresponding stars marked on a sky map follows in the next posting. As predicted, the back side of Avebury #10 (viewed henge-outwards) marks stars "above" and opposite the stars marked on the front side of Avebury Stone #10. The back side marks the Winter Solstice point at Zeta Cygni as a small bird being rescued from the cold by an elder. The back side thus shows the stars of winter. Note that the figures portrayed, a man and a woman and a community elder with distinguished-looking headwear appear to wear winter clothing, including bundled-up type coats, a winter cap and shawl and fingerless mittens of the type once typical for cooler northern regions. That all looks quite amazing for ca. 3000 BC, but than again, what had we imagined? Cold weather required appropriate clothes, also prehistorically. Our bright colors surely make the clothing look more modern than it is.... but we are trying to emphasize that the reader must make some substantial changes in his or her head about the sophistication of the megalith makers, also astronomically. The bottom large figure which we identify as a boat -- but it could be a sled -- is composed of many smaller figures (which we can not separately color here). Since the bottom figure could be a winter sled, we considered that the figures at the bottom in the boat or behind the sled might be rolling snow into balls for a snowman, but that is still speculative. In any case, if it is a sled, then the man and woman are presumably sitting in the sled as it were. In any case, the stars of Cepheus and Lyra are marked at the top of the back side of Avebury Stone #10, with Cygnus below. The necks of the three upper figureheads mark the Galactic Equator. The top of the back side of the stone, which has a whitish color different from the darker lower part of the stone, marks the bright span of the Milky Way. The bottom of the back side of Avebury Stone #10 marks by the Ecliptic. 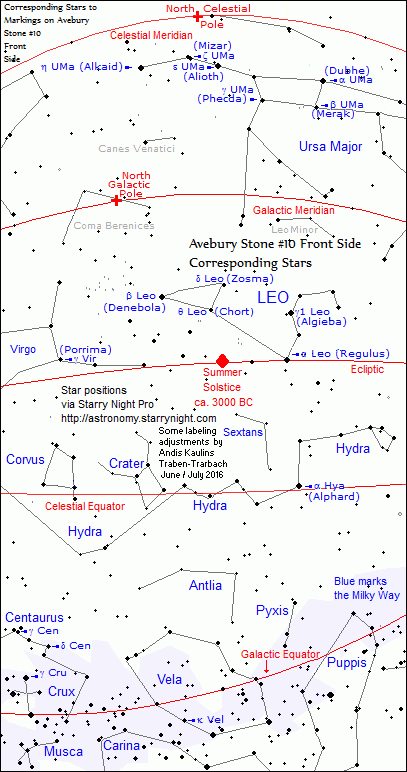 The left side of the stone's markings extends to the stars of Andromeda, the Great Square (of Pegasus), and Pisces, including the Circlet of Pisces. The right side extends to the stars of Aquila and Capricorn. 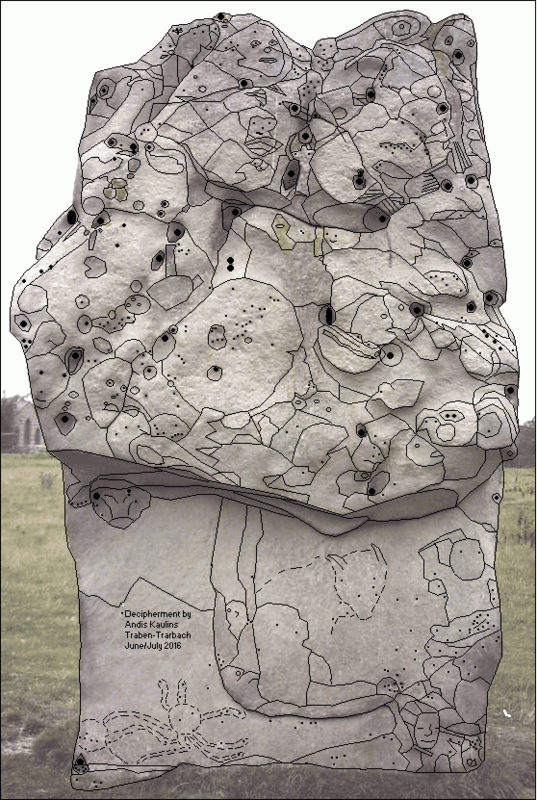 We have a star map of the region of the sky portrayed by Avebury Stone #10 Back Side in the next posting. and especially for content-related research, teaching, and educational use in general. Andis Kaulins retains the copyright to this image here in any case. Independent tracing of the original photograph by someone else and further work such as coloring become the copyright of the maker. Have fun! and learn thereby to better understand our ancient human ancestors! 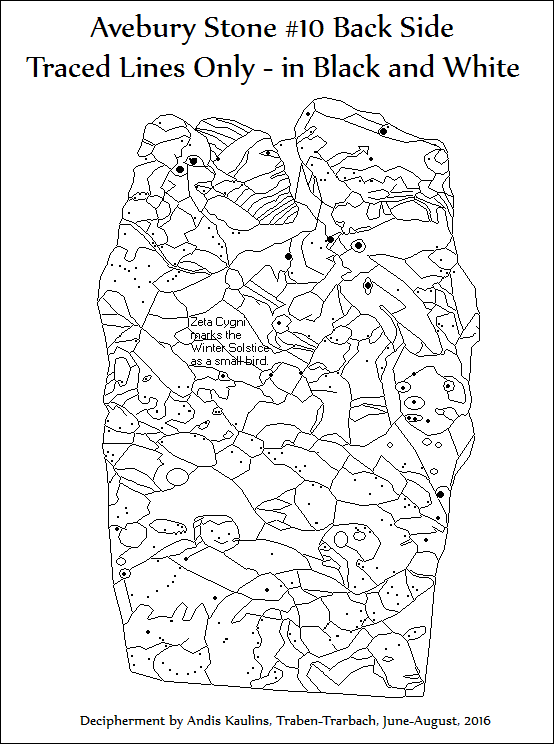 This is the tracing result for the back side of Avebury Stone #10 in black & white only. 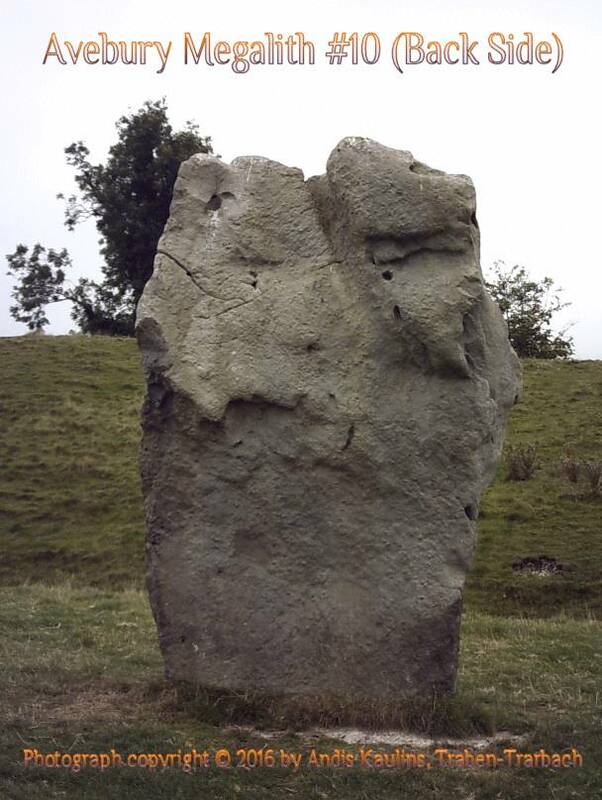 As predicted, and as we shall see in subsequent postings, the back side of Avebury #10 (viewed henge-outwards) marks stars "above" and opposite the stars marked on the front side of Avebury Stone #10. We have added the phrase "Zeta Cygni marks the Winter Solstice as a small bird". For more, see the next posting of this trace in color and with stars identified. 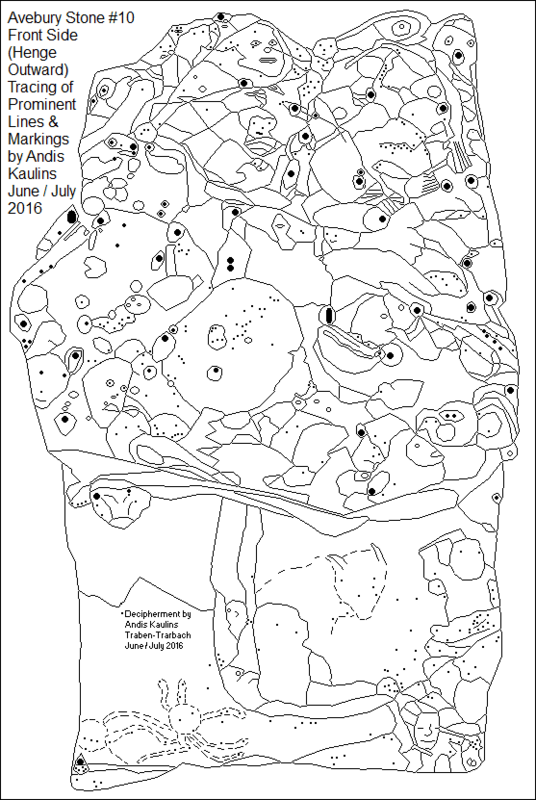 This is the tracing result for the back side of Avebury Stone #10. As predicted, and as we shall see in subsequent postings, the back side of Avebury #10 (viewed henge-outwards) marks stars "above" and opposite the stars marked on the front side of Avebury Stone #10. This is the color tracing result of the photograph of the right side of Avebury Stone #10 together with the corresponding star map, with the underlying star positions clipped via the superb software astronomy program Starry Night Pro, http://astronomy.starrynight.com. Explanatory thick red lines and various label adjustments were drawn and made by Andis Kaulins, who is not affiliated with Starry Night Pro in any way. 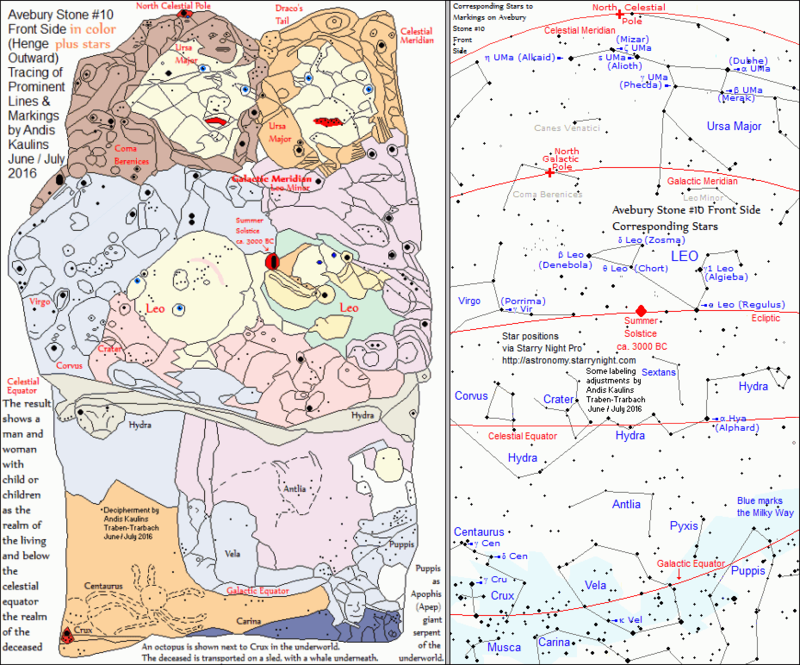 The star map below is an education regarding the astronomy of Avebury. 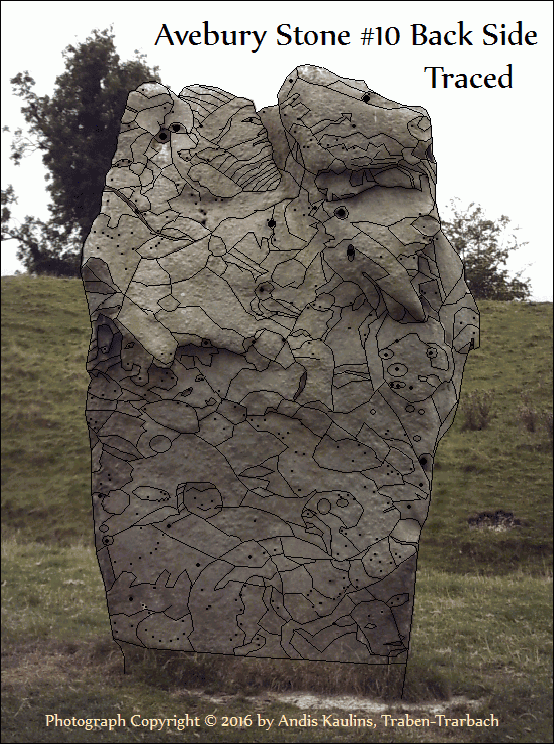 The region of stars depicted, as predicted, is to the right of the stars on the front side of Avebury Stone #10. The stellar region portrayed is otherwise defined by major astronomical parameters, with the Celestial Meridian building the left border and the Galactic Equator marking the bottom. Click on the image to obtain the larger, original image. The right side marks the stars extending to the Autumn Equinox and the Celestial Meridian ca. 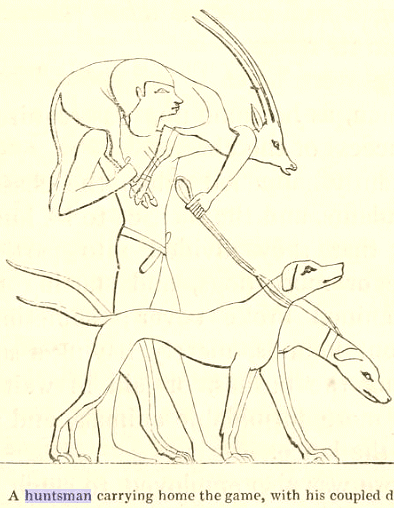 3000 BC. The stars marked begin at the top with stars today assigned to Boötes, Corona Borealis and Coma Berenices, as well as the North Galactic Pole and the Galactic Meridian. Marked in the middle are stars we assign today to Serpens Caput, Virgo, Libra, and the front stars of Scorpio. Also marked in the middle are the Autumn Equinox, Ecliptic and the Celestial Equator. Marked at the bottom are the middle and back stars of Scorpio, as well as stars of Lupus, Centaurus and Crux, as well as the Ecliptic Meridian and Galactic Equator. Consider the figures and what they represent. We see the astronomer-priest (some would write "druid") as Boötes at the top wearing a hooded pelt hat (Corona Borealis), with a Peacock-type of bird on his shoulder and a small monkey on his back, the latter marking the North Galactic Pole. 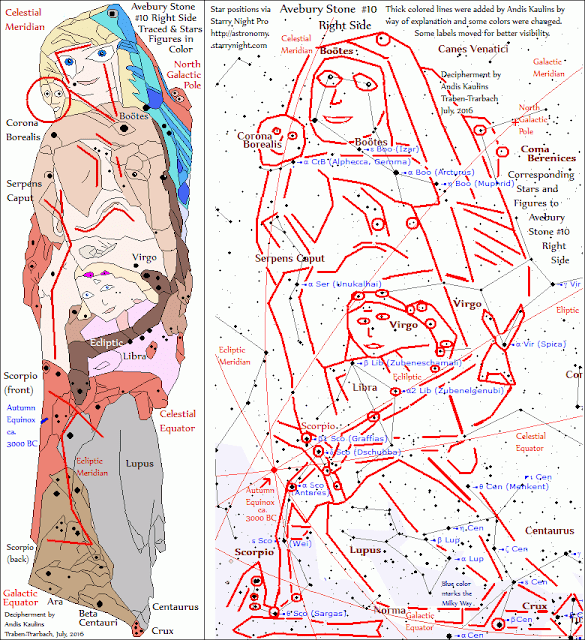 Below the astronomer-priest is a male figure whose head marks a portion of the sky with few bright visible stars to which we today do not give much attention (not a constellation), and below the male figure is a female figure as Virgo, though drawn differently than we do today. Some of the drawn aspects could be seen as fertility symbols but we do not go into that here. It's a touchy subject and not necessary for our decipherment work. We do not need the distraction. The back stars of Scorpio would appear to us to depict a seal in the water catching a fish at the tail, while Lupus is drawn to seemingly represents an osprey (sea eagle) catching the same fish at its head. We presume that this meeting point was meant to represent the cross of the ecliptic and the celestial equator at the Autumn Equinox point in the stars. The stars of Crux here are in the lower right corner, which corresponds to the lower left corner when the stone is viewed from the front side. 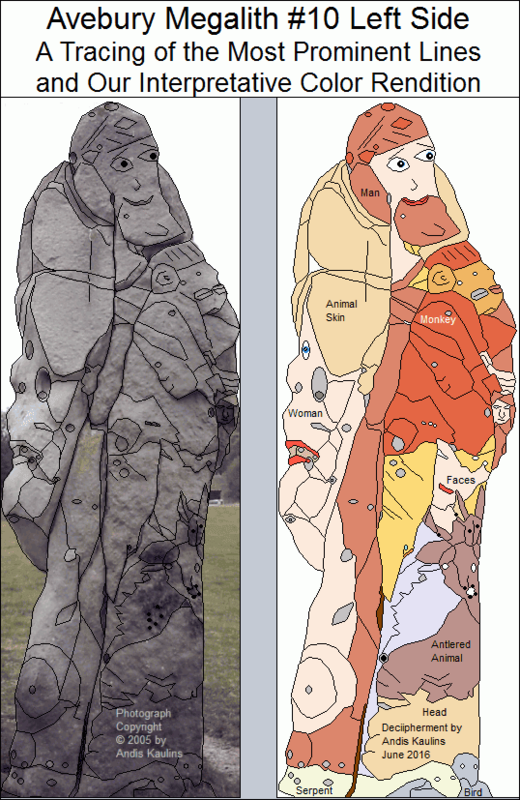 This is the tracing result for the right side of Avebury Stone #10. As predicted, the right side of Avebury #10 (viewed henge-outwards) marks stars to the right of the stars marked on the front side of Avebury Stone #10. The right side marks the stars extending to the Autumn Equinox and the Celestial Meridian ca. 3000 BC. The stars marked begin at the top with stars today assigned to Boötes, Corona Borealis and Coma Berenices, as well as the North Galactic Pole and the Galactic Meridian. Marked in the middle are stars we assign today to Serpens Caput, Virgo, Libra, and the front stars of Scorpio. Also marked in the middle are the Autumn Equinox, Ecliptic and the Celestial Equator. Marked at the bottom are the middle and back stars of Scorpio, as well as stars of Lupus, Centaurus and Crux, as well as the Ecliptic Meridian and Galactic Equator. Note how the major astronomical parameters define the borders of the stellar region portrayed. 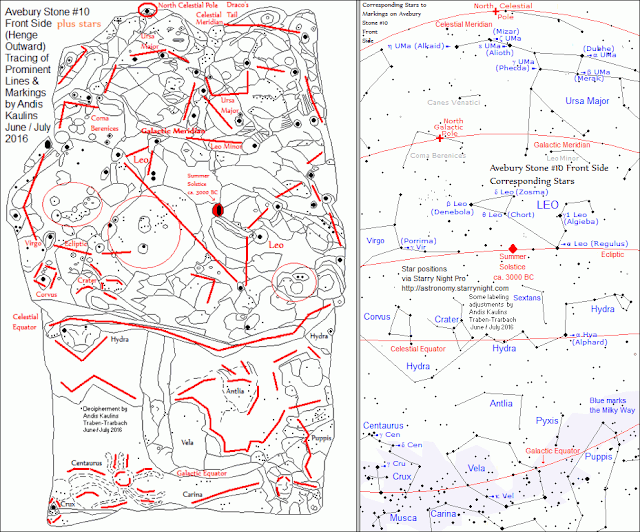 Make sure you view the corresponding star map in the next posting. It is an education in the astronomy of Avebury. The two similar motifs are separated by ca. 2000 years. The sky represented by the so-called tribute bearer (our discovery) is shown in the second image in this posting, which is below the first one. 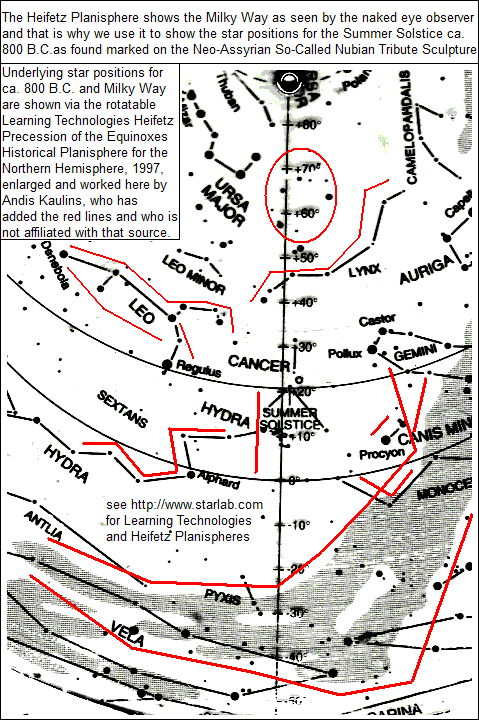 Clip from The Learning Technologies (http://www.starlab.com) Heifetz Precession of the Equinoxes Historical Planisphere (1997) which is used here to show star positions and the Milky Way for the Summer Solstice point in the stars at Cancer ca. 800 B.C. as found on the statuette. That date meshes exactly with the date assigned to the Statuette by archaeology. We have added the red lines to show how they match the Statuette. 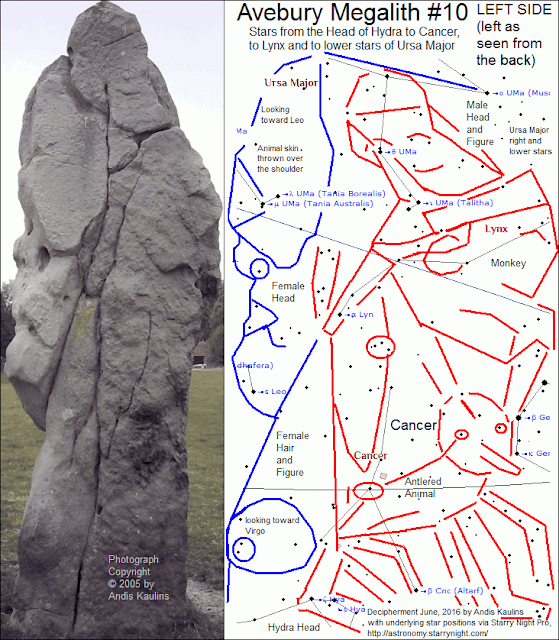 The image below compares the left side of Avebury Stone #10 with its corresponding stars, primarily the stars of Cancer, although the head and bosom of the female are marked by stars of Leo and Ursa Major. These are the stars to the left of those marked on the front side of Avebury Stone #10, with "left" as viewed from the back. 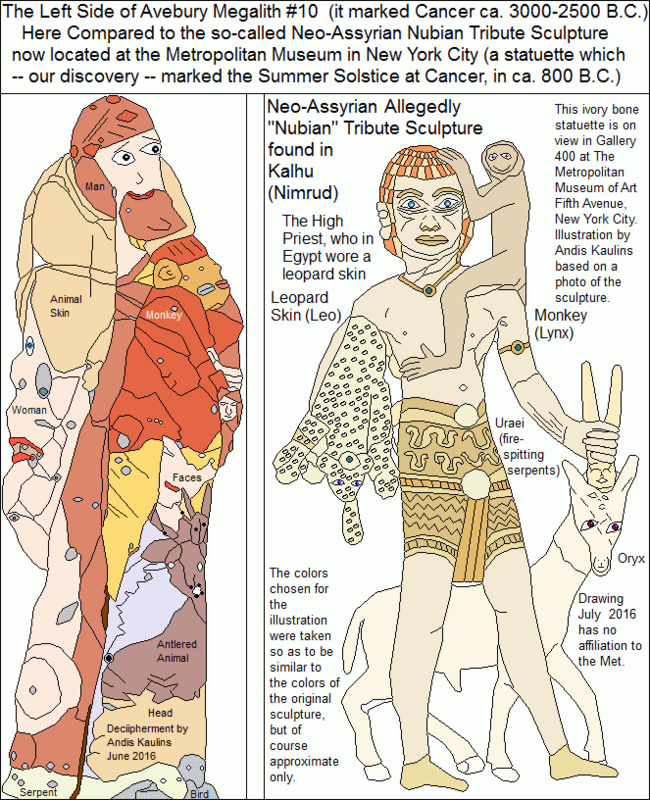 The entire "art" motif of the left side of Avebury Stone #10 is nearly the same as the so-called Neo-Assyrian Nubian Tribute Bearer, now in the Metropolitan Museum of Art in New York City. The near identity of the two motifs can be seen in the next posting. The underlying star map below is clipped from the astronomy software Starry Night Pro, http://astronomy.starrynight.com, which is the standard astronomy program we use. 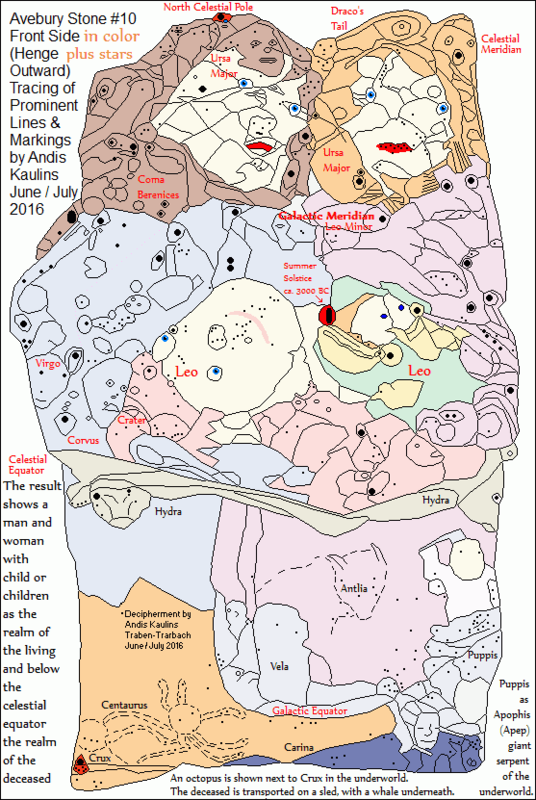 The decipherer Andis Kaulins has added the thick colored lines by way of explanation.